I have always been hugely freckley. Basically my entire body is covered in them and it runs in my Mum's side of the family and as far as I know is not due to excessive sun exposure but more genetics. But despite the family link I'm not going to sit here and say that I've always loved my freckles, just because they're on trend now. I've always had a bit of a love hate relationship with them. I've luckily never really been bullied for my freckles and everyone has always been more than complimentary (my boyfriend particularly loves them). My negativity towards freckles was in fact more a product of my own self-esteem. When I was going through that pale Maybelline Dream Matte Mousse stage (noughties teens ya know what I'm saying) freckles were my arch enemy. No matter what I did I couldn't cover them up. Some now will ardently say I shouldn't try but at the time when all your friends aimed for flawless even toned skin (even if it was orange) I felt I could never get my foundation to look as good. I thought my skin looked dirty because of all the dark coloured freckles cluttering my face. Combined with a couple of years of braces = recipe for insecurity. Freckles also cause a huge problem (in the mind of a teenage girl) when everyone gets into the tanning stage. I cannot for the life of me get a tan. If I'm out in the sun without at least factor 30 I sure as hell will turn into a burnt little peach. So when your whole school year are going on about the tan they're going to get on their sixth year holiday it's quite hard to join in. And lets be serious, fake tan never really looks that good on freckled skin because soz ladies we're naturally pale and anything else is just too obviously fake. So it was for these superficial reasons that I developed a negativity towards my freckles. They left me feeling a bit left out and I'm not shy to admit they were bloody superficial reasons. I think I'm always going to have a love hate relationship with my freckles but now as an adult it's definitely tipping far more towards the love side. Or at least the acceptance side! I'm never going to be able to have that flawless base and I'm never going to naturally tan but I've changed the way I approach make-up to adapt for that, just as you would with a different skin-type. In fact one of my first ever blog posts was on make-up for people with fair skin and freckles (please excuse the amateur nature of the post!). I try to find paler foundations as the standard yellow-y/orange tones are just never pale enough for my skin tone! If anyone knows great ones please let me know - they should really do a pale person range haha, make-up brands are you hearing me?! I've also resigned myself to the fact that I don't suit fake tan (after a couple of hilarious disastrous attempts with gradual moisturising tan) and that I'm not going to tan naturally. I've just accepted that I'm pale and there's no point trying to be any other colour. I may as well slap on the factor 50 and preserve the skin I've got and I think I've become pretty happy with that. That's one bonus of having freckley or pale skin. I'm very careful in the sun and have always been aware of the dangers of skin cancer as it kinda comes with the freckles and pale skin territory. I actually think having pale skin has helped me rather than hindered me here as I've always had to be that bit more careful than other people. Maybe I'll look super youthful at 40 huh? 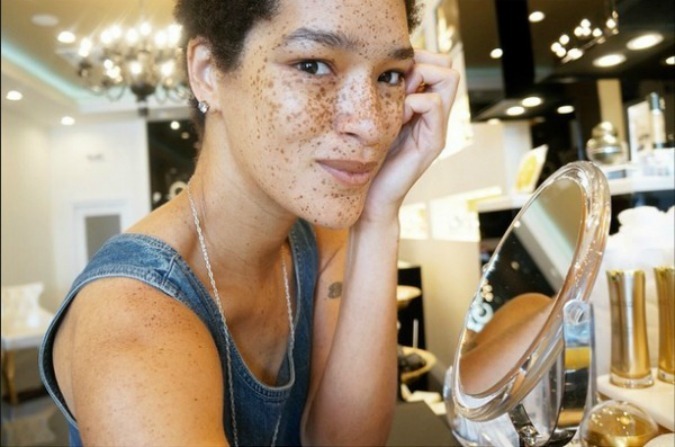 Model Nikia Phoenix is a fantastic example of someone who has accepted her freckles and looks absolutely beautiful while doing so. "Yes, I've had my moments when I wished that I could just fit in with a crowd, but I'm glad I stand out. Through the good times and bad, I’ve learned to love what makes me me." Now I'm beginning to learn that my freckles are what makes me me, and yes they can look cute sometimes. Perhaps young girls with freckle faces will now be envied for their freckle spatterings as the freckle trend is now so popular and instaworthy. It's quite funny the way the world works that suddenly this insecurity that many had as young 'uns has now become sought after. 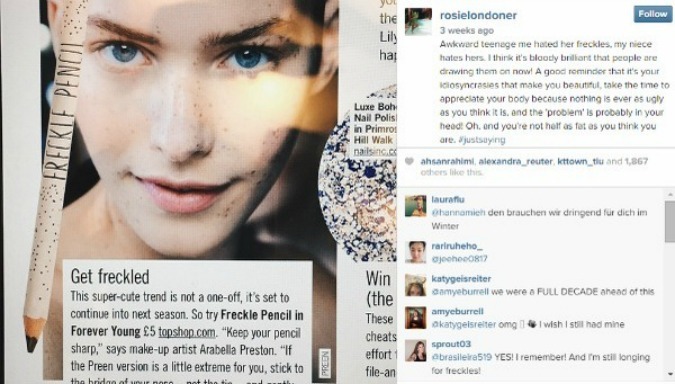 So sought after that now even professional make-up artists are taking to drawing freckles on their celebrity clients. However, we'd all love to have that delicate Kendall Jenner spattering across our noses but alas I was gifted a plenty and therefore it'd be pretty hard to draw them on my style and it could take you a few months... So I'll saunter away with my freckle face held high knowing fine well in the knowledge that I won't have to wipe mine off at the end of the day! What do you think of the freckle trend? I absolutely love freckles - I really think it gives character to a persons face, but I also know that a lot of people who have them hate them. 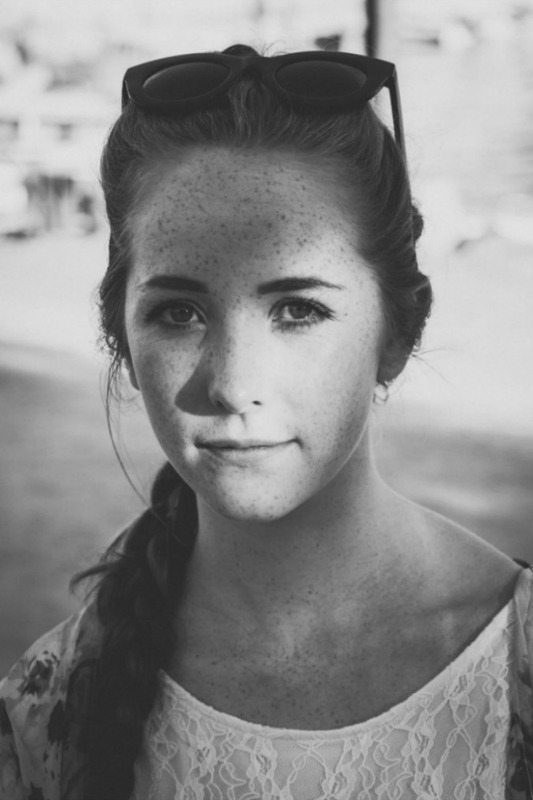 My sister for example hates her freckles, you can say whatever you want, but I guess she'll never like them. Hope you can embrace all your freckled beauty! Hi Mel! Yay for freckle lovers! I think it just takes time, age and confidence to start to see the beauty in your own quirks. I love what you say about them giving character to the person's face though - I never thought of it that way! Thank you so much for your lovely comment! I'm so glad you're loving what makes you special. Hi Nikia! It means so much that you've seen this post and commented on it! Thank you for being a beautiful inspiration. Hi Amelia! Thank you for your lovely comment :) so kind of you!